Why syncope is rarely fatal ? Syncope by definition is a transient loss of consciousness due to cerebral hypo perfusion and loss of muscular tone, and the patient falls but recovers fully and gets up either assisted or spontaneous.The cardiac and vascular counter response to syncope is most often intact .This makes syncope characteristically transient . If a patient does not recover from syncope it could either be a prolonged loss of consciousness( Stroke etc) or if he never gets up he will be called a victim of cardiac arrest or a SCD ! (Sudden cardiac death ) . So technically by defintion , all patients will have to survive the syncopal episode. How prolonged a syncope can be ? What are life threatening syncope and non life threatening syncope ? What is the link between, syncope and SCD in patients with ventricular arrhythmia’s ? Some case of long QT syndromes could be life threatening especially in children as they inherit sudden death. A patient with a non sustained VT may develop syncope if the VT becomes sustained especially if there is underlying heart disease and LV dysfunction . Among this few , may degenerate into ventricular fibrillation and patient may die. How common is syncope in acute myocardial infarction ? Syncope is a very rare presentation of acute myocardial infarction. Can syncope precipitate or precede a cerebro vascular accident ? Prolonged syncope , TIA, stroke in evolution and completed stroke can be a continuous spectrum in patients with carotid and cerebrovascular disese . But when a syncope evolves in to a stroke the patient is not considered to be a victim of syncope but they enter the stroke protocol. *Metabolic causes coupled with simple vaso vagal(Neuro cardiogenic) constitute the bulk of causes of syncope .Siezure disorders are very common and a close mimicker of syncope and need to be ruled out. How to work up a patient with syncope ? First , one need to confirm it is indeed a syncope . If the initial examination is not clearcut one need to go back to the history and ask for circumstances under which the syncope occured and details of prodromal symptoms if any . Patient’s family members who witnessed the event can give useful information . It is the most cost effective ( Comes free of cost infact !) investigative tool available .Cardiac syncopes are usually sudden, vasovagal often have environmental or emotional factor. Apart from routine investigations , ECG, Echocardiography, holter are done generally, head up tilt test, Loop, event recorders may be reuired in few. Syncope is one of the common symptoms in cardiology and general medical practice. Many times the diagnosis is easy . Common syncope is never fatal but , ruling out dangerous tachy and bradyarrhythmias is a key aim. In a significant number (20-30%) identifying the cause could be really difficult and may never be made in spite of the modern diagnostic tools. These syncope of unknown origin is grouped along with the neurocardiogenic category. The one, positive thing about syncope is (unlike chest pain) , it is rarely fatal in it’s first episode , gives the physicians to investigate and correct the underlying problem. Has publications in various Journals. Family medicine and community health care. And socio economic aspects of health care. Secured three gold medals for excellence in cardiology. 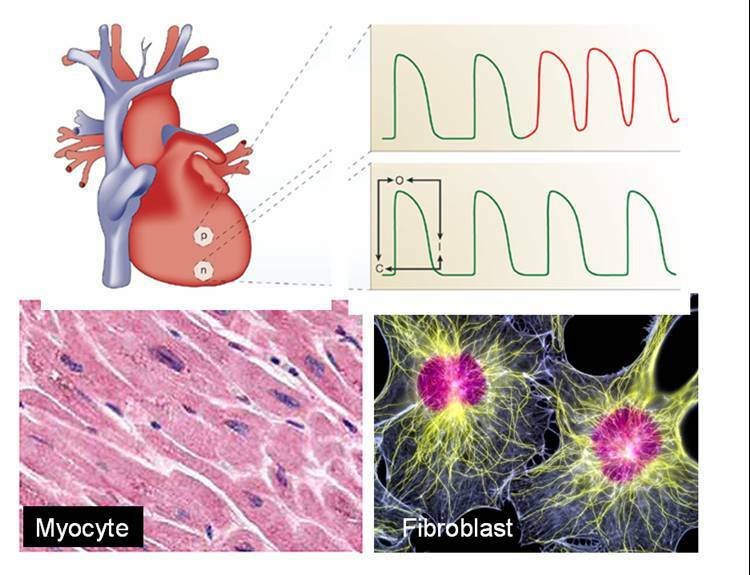 Electro physiology, expert systems in cardiology., clinical research in acute coronary syndromes, preventive cardiology, bio ethics, outcome analysis , logistics in cardiology and publishing online journals. Sundaram Medical Foundation, Chennai India. 2 .Thrombolysis in hyperacute MI. 4. Left Ventricular Mass in Pregnancy Induced Hypertension. 5. Dissection of interventricular septum by unruptured right sinus of valsalva aneurysm resulting in complete heart block. 15. Therapeutic issues in Stable Ventricular tachycardia: A coronary care unit perspective Indian Heart Jr 2000: 52: 808. 17.Isolated Diastolic Hypertension .World congress of cardiology 2002 sydney poster presentation..
22.Safety and efficacy of angiotensin-converting enzyme inhibitors in symptomatic severe aortic stenosis: Symptomatic Cardiac Obstruction-Pilot Study of Enalapril in Aortic Stenosis (SCOPE-AS). 23.Rheumatic heart disease occurrence, patterns and clinical correlates in children aged less than five years.J Heart Valve Dis. 2004 Jan;13(1):11-4. 24. Estimation of subjective stress in acute myocardial infarction. J Postgrad Med. 2003 Jul-Sep;49(3):207-10. 25. Serum phosphate in acute myocardial infarction. Indian J Physiol Pharmacol. 2000 Apr;44(2):225-8. 26. Canadian Cardiovascular Society classification of effort angina: An angiographic correlation. Coron Artery Dis. 2004 Mar;15(2):111-4. Is there an antomical continuity between pleural space and pericardial space ? The pleura and pericardium are very close anatomical companions within the thorax. Both contain minimal levels of physiological fluid. It is quiet common to find combined pleural and pericardial effusion. While the commonest explanation for combination of pleural and pericardial effusion is inflammation of both in systemic disorders like polyserositis or malignancy . In cardiac failure also both effusions can occur explained by raised venous pressure. 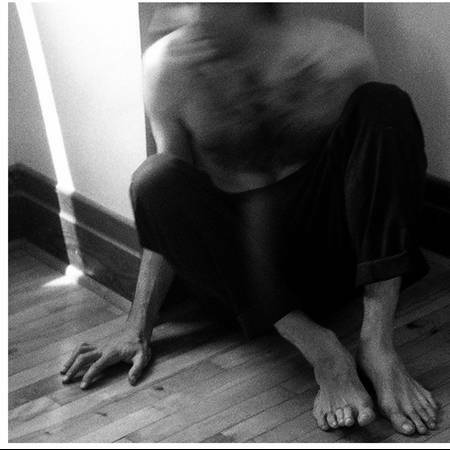 But there has always been a curious relationship between these two spaces. Is there a antomical or physiological link between these two spacs ? In fact a large pleural effusion some times result in sympathetic pericardial effusion. Tapping of pleural effusion may regress this pericardial fluid as well. This is purely a clinical observation and needs an explanation .It is believed , there is some non functional lymphatic channels shared between pericardial and pleural spaces.This may get opened up in pathology of either of them. What is the mechanism of pericardial rub ? 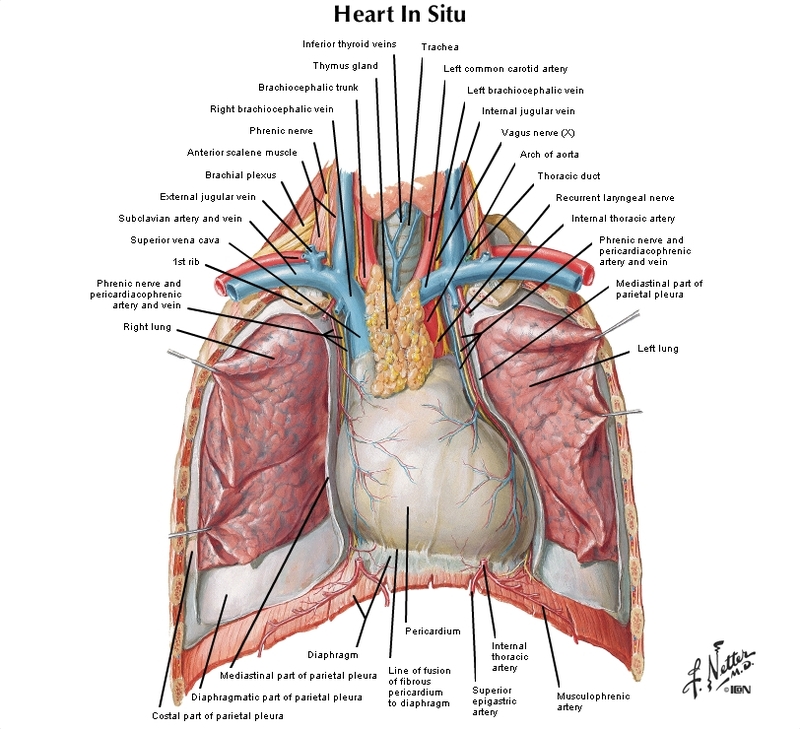 Heart is externally covered by two layers of pericardium . 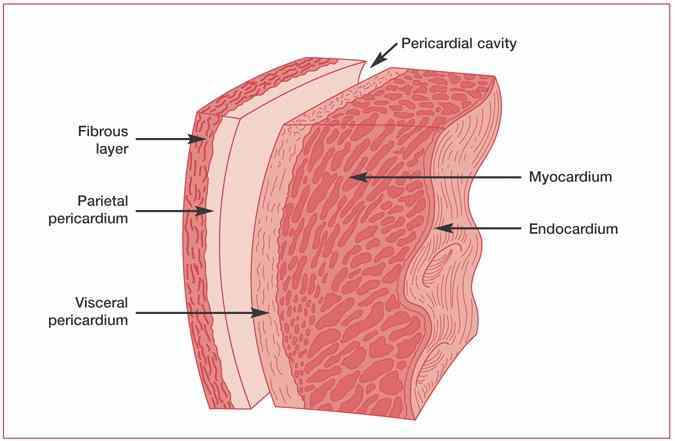 Pericardial space is formed between parietal and visceral layers of pericardium . It is a narrow space which is normally lubricated with pericardial fluid up to 25ml. When these two tissue surfaces come into contact , pathological rub takes place.It is heard whenever the pericardium is inflammed . Pericardial rub is a distinctive but uncommon clinical sign . Pericardium has two layers . There are four possibilities for pericardial rub to take place. 2.Between the visceral pericardium and the epicardial layer of heart*. The second and third mechanisms are very rare. We have realized one more possibility . Diaphragm forms the floor of the heart on which the hanging heart rests . Rubbing of pericardium over diaphragmatic surface is a beat to beat affair that lasts the entire life !. In inflammatory states of diaphragm especially the contagious ones from abdomen , can result in pericardio- diaphragmatic rubs .These rubs are almost impossible to hear clinically. *The anatomic mystery : Is epicardium same as visceral layer of pericardium ? Some anatomist feel that both are same entities. 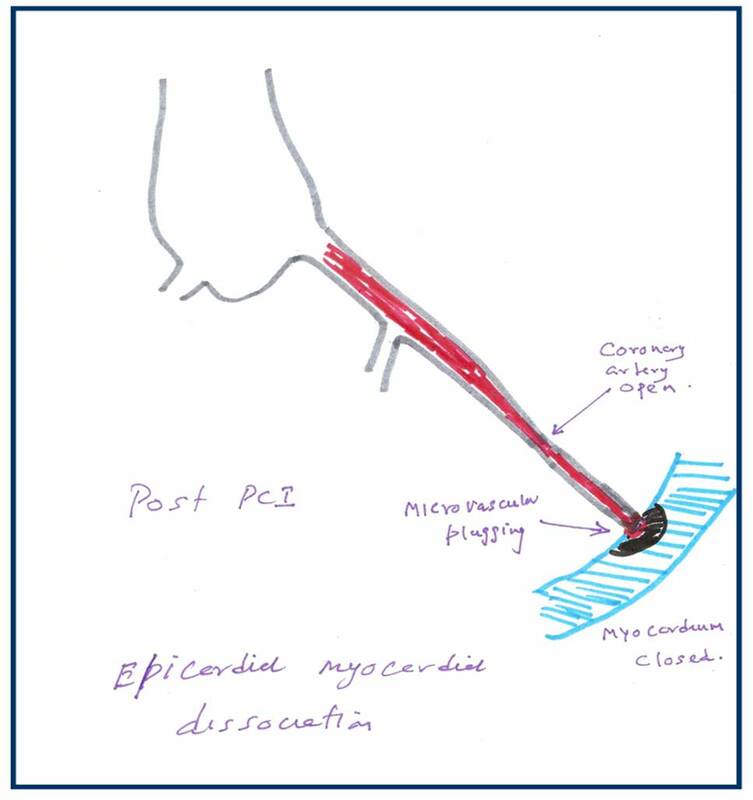 If that is the case myocardium can never split its relationship with visceral pericardium.But it is also a anatomical fact visceral pericardium engulfs the coronary artery and are located sub epicardially. How many components of pericardial rub are clincally heard ? Pericardial rub classically has three components. Systolic, mid diastolic, and pressytolic atrial components. Pericardial rubs are typically described as to and fro rub. Systolic component is most consistent. In atrial fibrillation mono component pericardial rub is heard. Left sternal border , left 2nd or 3rd space .Best heard in sitting , leaning forward in inspiration. Many times the rubs are transient and evanescent . Since it has multiple components it may be mistaken for added heart sound like S 3 or S 4. What is the mechanism of pericardial rub in the immediate post MI phase ? Presence of pericardial rub post MI indicate a transmural involvement or atleast significant epicardial involvement . Recognition of this is important as presence of pericardial rub increases the risk of rupture and hemorrhagic effusion if anticoagulants are used. What is the relationship between pericardial effusion and pericardial rub ? Generally it is said with the onset of effusion pericardial rub disappear.But this is not necessarily true. Rubs after contusion chest and fracture ribs can be with the chest wall and may have no relationship with effusion. Is pericardial rub a painful condition ? Pericardial rub associated with acute inflammatory pathology is severely painful (like a pleuritis).But pericarditis associated with chronic inflammatory conditions are less often generate pain.The exact reason is not known. What is pleuro pericardial rub ? This clinical entity is poorly defined , often taught by veteran professors in clinical auscultation classes.It can be heard in the mid segment or diaphragmatic pleuritis with or without pericardial effusion in patients with atypical pneumonias. What is no reflow ? What is the mechanism of no reflow ? No reflow is the terminology used primarily in cath labs where, even after a successful opening and stenting of a coronary artery the coronary blood flow is not restored to myocardium . The point to be emphazised here is blood do cross successfully the site of the obstruction but fails to enter the muscle segment to which the coronary artery is supplying. So the paradoxical situation of artery being open but the myocardium is closed to receive blood flow happens . This is termed as no -reflow. Actually it is a misnomer , and ideally it should be called “no flow” because normal distal flow does not occur (After PCI) in the first instance to get interrupted later on and be labeled as no re-flow. 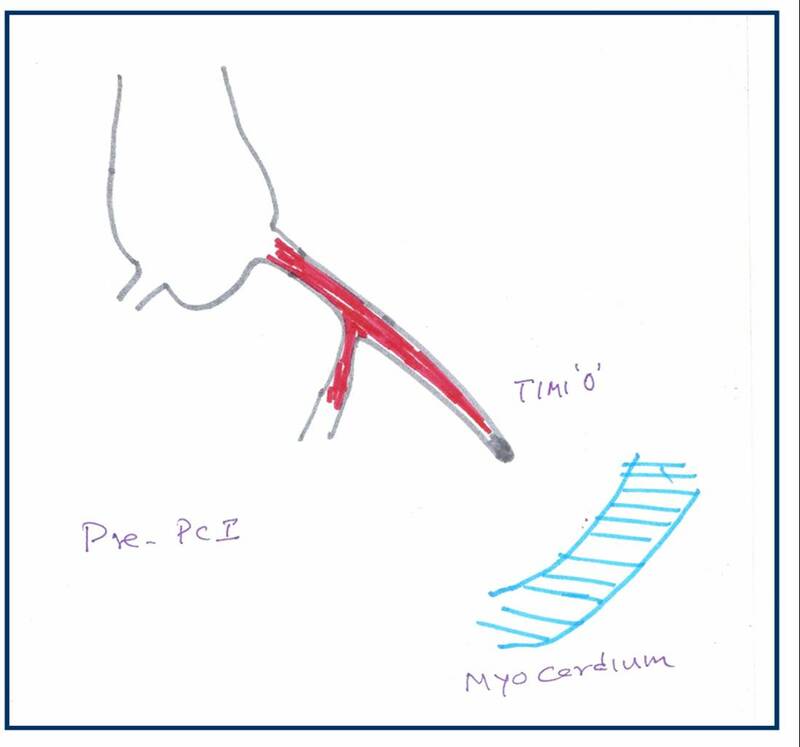 .The only positive effect of PCI in these situation is blood flow would have improved by few centimeters ie till it reaches but falls short of myocardium . In fact no reflow , can be termed as glorified and concealed terminology for PCI failure . It needs urgent action . No reflow is also called as myocardial epicardial dissociation. Curious case of open coronary artery and closed myocardium ! Coronary microvascular plugging is mainly due to thrombus and atheromatous debri , myocardial edema , microvascular spasm may also contribute. Where can it occur ? First described in cath lab, especially following primary angioplasty. It can very well happen following thrombolysis in STEMI. Can occur in venous grafts. How do you recognise no reflow? In cath lab it will be self evident from the check angiogram. Some times it is less obvious and may require, myocardial blush score, TIMI frame count, contrast echocardiography, PET scan etc. In post MI a very simple method to recognise this entity could be the observation of persistent ST elevation in ECG . Extremely difficult. Almost every coronary vasodilator has been tried. (Nitrates, nicorandil, calcium blockers, etc).Success is less than 30%. High pressure flushing with saline inside the coronary artery is advocated by some.Others believe it’s dangerous to do it. So prevention is the key. Avoid doing PCI in complex, thrombotic lesions. Use thrombus suction device like export catheter(Medtronic). Distal protective devices are double edged devices , useful only in experienced hands. What is the size of the particle (thrombotic and atheromatous debri) the coronary microcirculation safely handle and push it into the coronary venous circulation and the coronary sinus for disposal ? If we can lyse the thrombus into micro particles by some mechanism and make it traverse the coronary circulation this complication of microvascular plugging can be treated and prevented . What is the final message ? More common in complex thrombotic lesions. Treatment is often vexing . In fact the treatment of this condition is so difficult , it can be termed almost synonymously with “Failed PCI” if flow is not restored. Successful treatment of no- reflow means not momentry restoration of myocardial flow by mechanical and pharmacological modalities ,but to maintain sustained myocardial perfusion. This we realise, as patients who have had a no reflow during a PCI, do not perform as well in the follow up . So prevention is the key. Why thrombolysis rarely fails in right coronary artery ? Failed thrombolysis occurs in significant number of patients ( 30-40%). Persistent ST elevation 120 minutes after thrombolysis is best indicator of failed thrombolysis. It has been a consistent observation failed thromolysis is more frequent in anterior or LAD myocardial infarction. 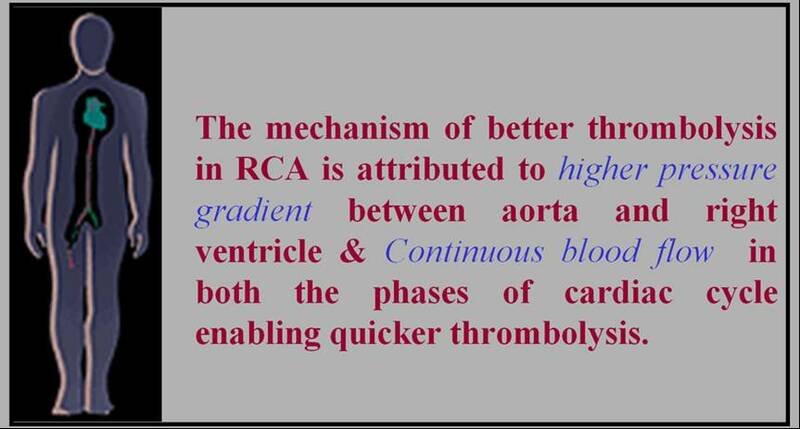 The mechanism of better thrombolysis in right coronary artery is simple.The success of thrombolysis , apart from early time window , is directly correlated with pressure head and the duration of contact between the thrombolytic agent and the thrombus. In right coronary circulation the blood flow is continuous , occurs both in systole and diastole that facilitates the maximum delivery of the thrombolytic agent . Further there is a favorable pressure gradient across RV myocardium as the transmural occluding pressure across RV is considerably less then LV myocardium. What is myocardial ventricular tachycardia ? and non myocardial ventricular tachycardia? The cell of origin of ventricular tachycardia is rarely discussed at bedside. It is still in research labs ! Ventricles are not made up off entirely myocytes. Apart from myocytes it contains specialised purkinje cells , fibrocytes, interstitial cells and some times primitive mesenchymal cells. 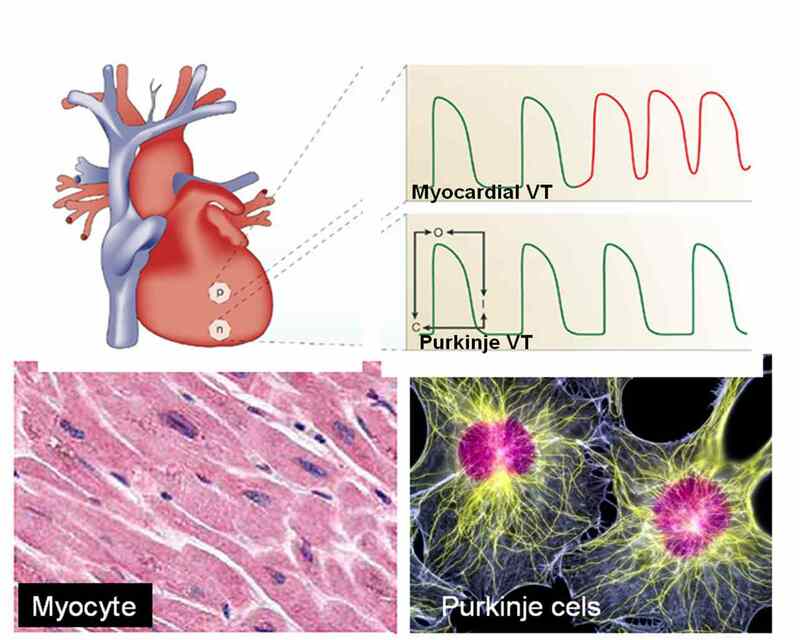 Ventricular tachycardia can arise either in purkinje cells, the myocytes or even the fibrocytes. The myocyte VT classically occur during ACS or post infarct VTs.They are more often hemodynamically unstable and quickly degenerate into ventricular fibrillation. Myocardial VT is likely to be pulseless and require DC cardiversion frequently. Purkinje VTs are relatively less unstable. If VT arise proximally in the septum near the distal his, or in bundle branches (BBR) the VT is more stable.They are likely to respond to be medical management. What is the therapeutic implication of knowing myocardial VT ? In fact ,simply knowing the cell of origin of VT is not suffice .The ionic currents inside the cell that trigger and sustain the VT is more important. There are few ionic circuits responsible for VT. Sodium , Intra cellular calcium, potassium , beta receptor mediated calcium current.If we know the individual ionic culpirit we can block that specifically . Now we have multi purpose ion blockers like amiodarone which acts like a broad spectrum antibiotic and terminates a VT. So as of now there is no real purpose of breaking our head in locating the cell of origin and the ions responsible for VT at the bed side ,( Researchers will do that for us !). We have only few antiarrhythmic drugs available in our crash cart .Our job is to choose the optimal drug which will fit in for our patient. In electro physiology labs, radio frequency ablation is done .This is nothing but shooting down the abnormal electrical focus (Cluster of cells or a samll segment of myocardium). In future, a single abnormal cell could be selectively neutralised with cell based therapy assisted by nanopore robots !